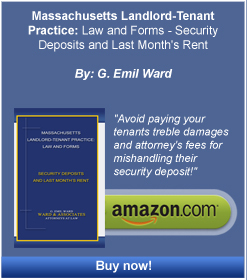 Real Estate Partnership Dissolutions - Boston Real Estate Attorney. Eviction Law. Zoning and Variances. Housing Discrimination. A partnership exists when people commit their resources and labor to a business venture in which they intend to share the profits, losses, management and control of the business. Sometimes the line between a real estate partnership and simple co-ownership of property is blurred. But, there are distinct differences which must be resolved in court, if the partners cannot resolve their real estate partnership issues amicably. Ward & Associates assists in the court proceeding wherein past debts, contingent obligations, and future obligations are determined, along with ownership interests in the real estate partnership going forward. Sometimes the partnership must be terminated. Sometimes the venture continues. Our firm has worked with some of the best forensic accountants and appraisers in the state to obtain the best result for our clients who may be stuck in a real estate partnership with intransigent partners. Also see the testimonial of Gary Multer. Please contact us to discuss your legal needs if you are stuck in a real estate partnership with partners who will not allow you to bring the property to its highest and best use or who will not grant you the income or interest you legally deserve. Our fees are usually quoted on an hourly basis. But, each situation is considered on a client by client basis in an attempt to arrive at the most accommodating fee structure, given the needs of the client and our firm.